This place is recommended not because of its food, but the cross language pun in its name. In fact, it is already out of business. 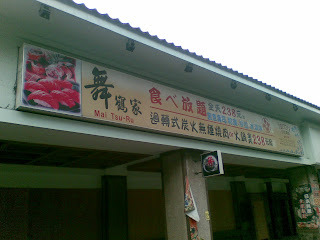 Its name: Mai Tsu-Ru, in Mandarine Chinese is pronouced as Wuhejia, which sounds like "It is indeed delicious" in Taiwanese. Mai Tsu-Ru means "The House of Dancing Cranes". 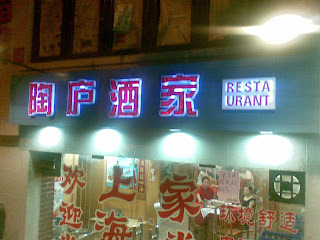 It is a very poetic name for a Japanese restaurant. 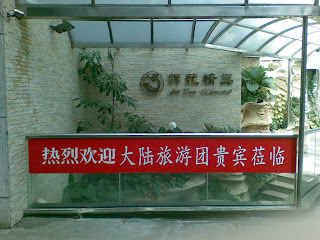 披風的結是用傀儡的手打成的/The knot of the cloak is done by the hands of the puppet. 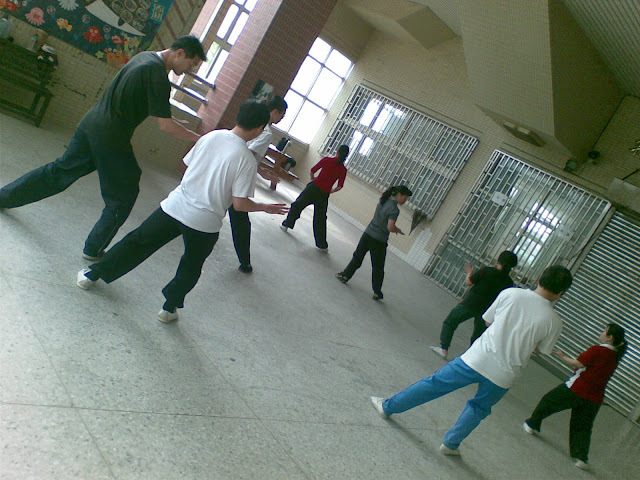 Bowel on the Head is one of the acrobat programs originated in Sichuan Province of China. Though the title of the program claims "bowel", it is actually a lamp. The bowel contains oil and it is lit. 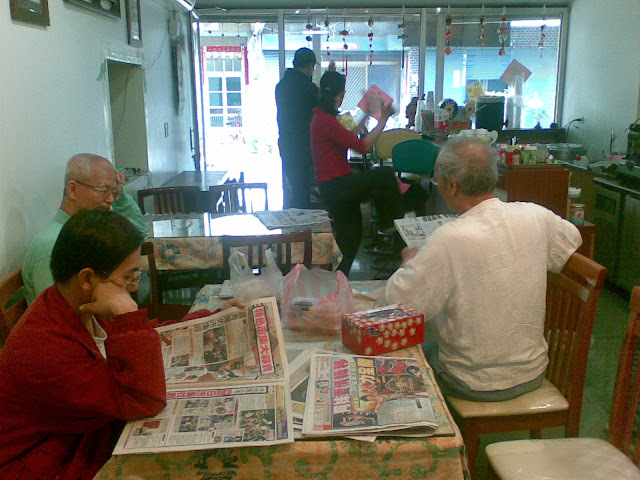 The scenario is: the husband has been out playing majhong till late at night. The wife punish her man by asking him to perform all kind of acrobat moves with a lamp on the top of his head. 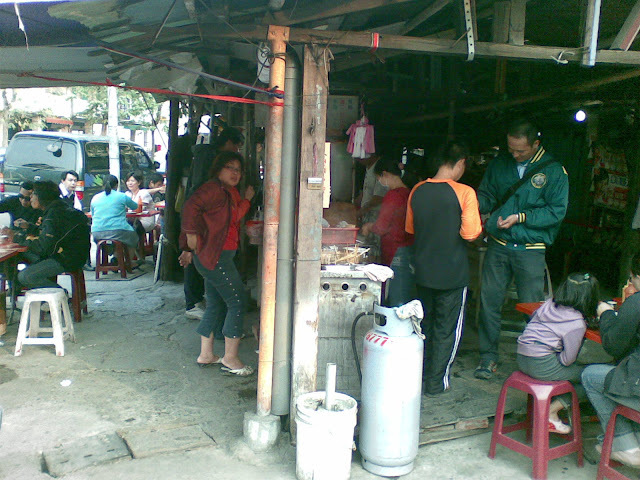 This place is so good that not only it is located in a small alley, they do not even have a sign. Yet, finding an empty table can still be a challenging task. Update: Moved. Please find the new location at the of this article. I do not recall sampling anything like this in Shanghai. 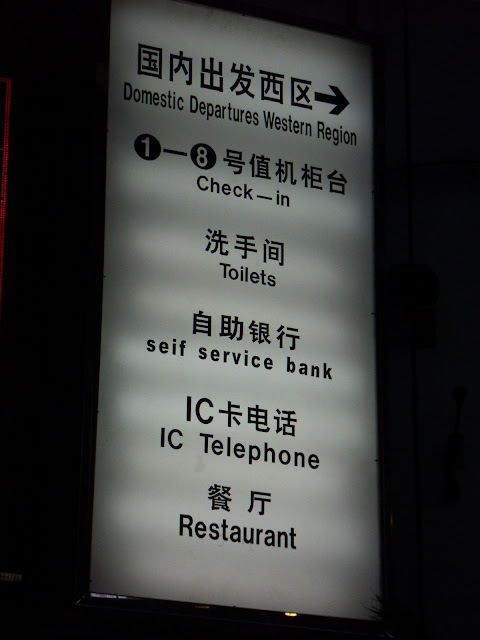 However, the hostess is indeed a immigrant from Shanghai. She has not been here very long, but already can carry a conversation in Taiwanese. If you intend to sample their cookies, be there early. They run out freaking fast. We arrived around 11:30. Only two of five flavours were left. It is a stereo type that it is advisable to marry Shanghainese ladies, but not to date them. As girl friends, they are very high maintenance. However, once become a wife, they will work hard. Their conning skills will be working for the benefit of their families, too. I have not yet been able to verify about the myth of Shanghainese girl friends. 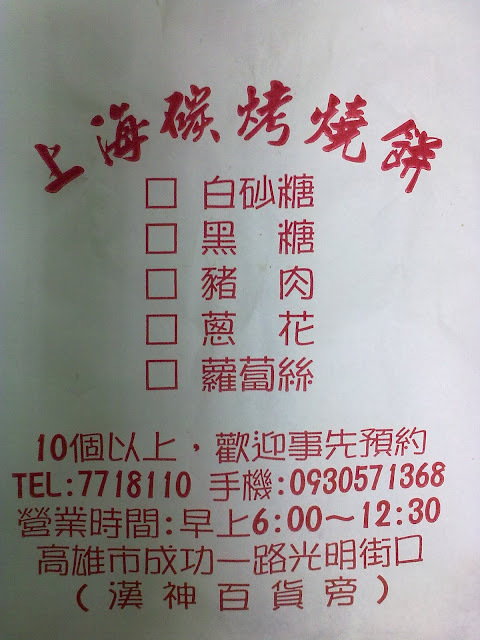 This vendor seems to be a proof of the Shanghainese wife part. Think of it as Bouillabaisse with steamed rice, much less spices, and a lot more refreshing. Around USD$2 a bowel, the value is excellent. Origin: sent by e-mail from a friend. church sit in own pew. 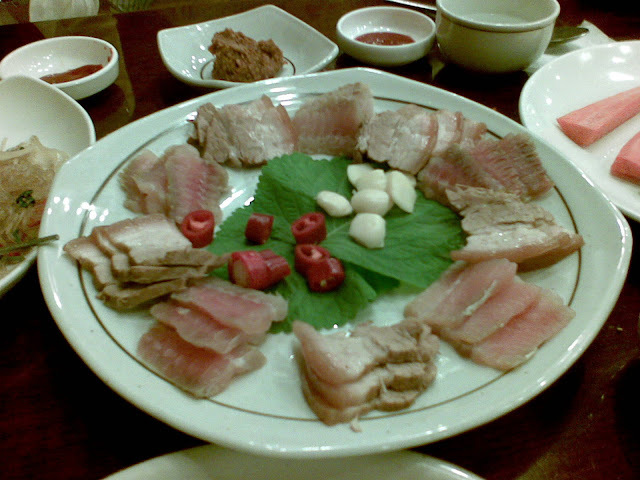 The literal translation of this dish is Black Wheel, but it has nothing to do with rubber. After Japanese kicked the crap out of Qing Dynasty of China in 1894, China hand over Taiwan to Japan. Black Wheel is a reverse engineered dish from Japanese Oden. 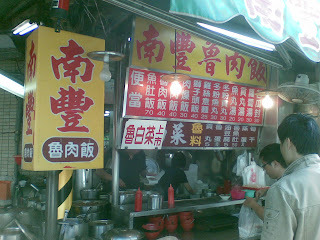 Oden sounds like black wheel in Taiwanese, hence the sign reads "Black Wheel." It is mostly made of fish paste. 林強的黑輪伯仔/A song about a man selling "Black Wheel." 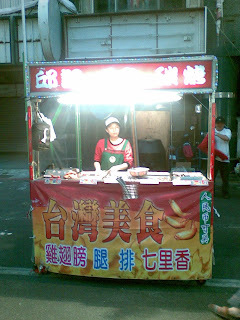 A Taiwanese proverb goes like "The best occupation is to sell ice treats; the second to be a medical doctor." Granny's Ice Treats apparently has reached the status of the best of the best. 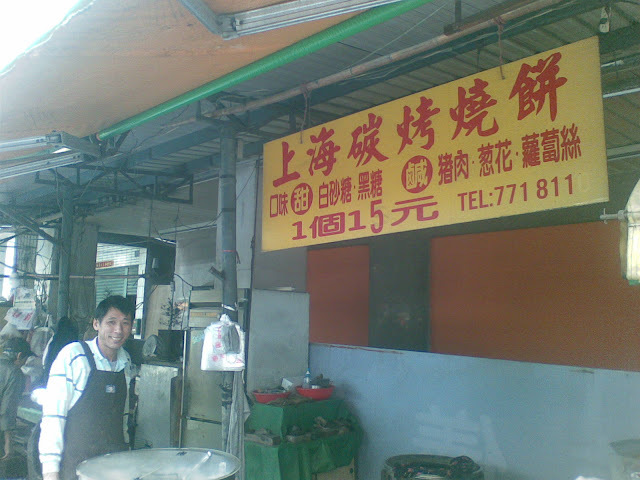 Back in those bad old days when Taiwan was still poor, die hard customers already drove from distance to pay their respect to this humble vendor. Rumor has it that after granny passed away, the grand son and his uncle went to the court to fight for the name of Granny's Ice Treats. I do not know who won the case, neither who owns which name. I only know there are two Popobing and one Ahpobing. I have sampled both. My preference goes to Popo Ice. 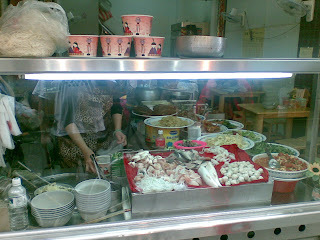 In addition to personal taste, it was also the one my mother took me long time ago. Both places are creative on developing new treats. However, I still prefer those traditional treats. I strongly recommend Four Fruits Ice, Red Bean Milk Ice, Star Fruit Ice, Star Fruit Drink, and Black Plum Drink. 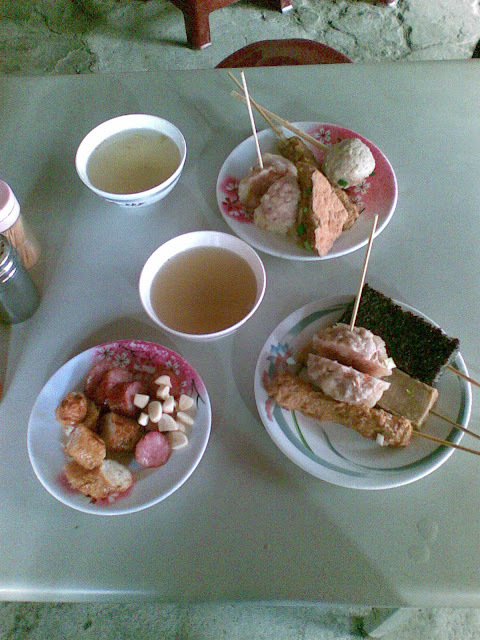 The delicacies in the plate are pork, stinky fish, garlic, and pepper. Served with seasonings and wrapped in veggie leaves. It stinks a lot, but tastes great. This was a treat from Korean co-worker, as I requested something "special". 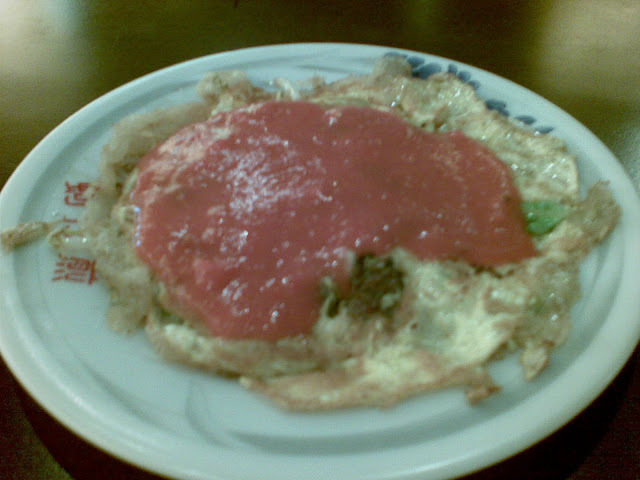 Oyster Omlette is one of the Taiwanese classics. This particular vendor is my favourite. 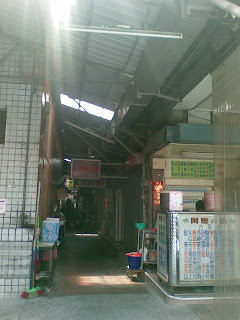 This vendor used to be located at the 9th floor of President Department store before the fire. I had had been missing it. 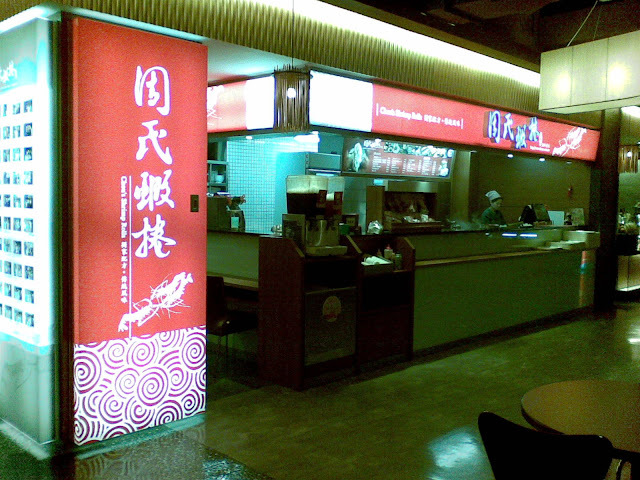 A couple of years ago, i recognized its taste in the basement of Sogo. I asked the boss "Were you at the 9th floor of President Department Store?" The boss replied "Yes." I said "Another plate, please." 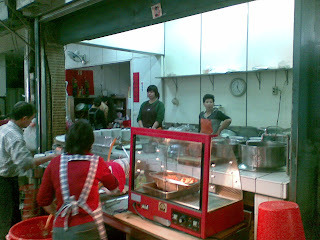 Later, this vendor disappeared from the basement of Sogo. My quest resumed until I found it once more in FE 21. 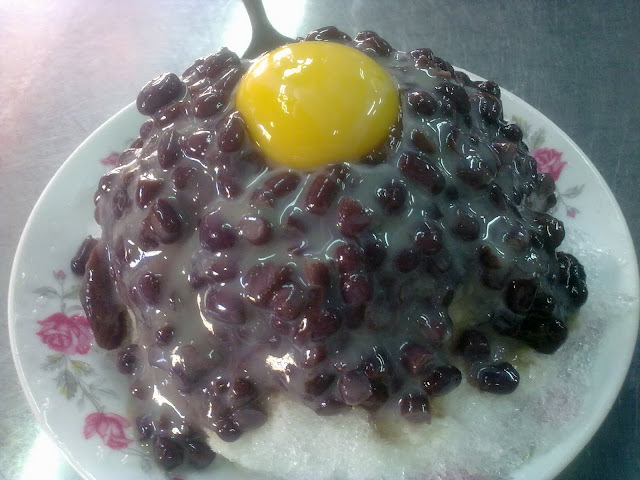 There is a very similar dish in Chaozhou cusine. 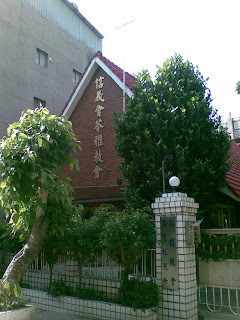 There is a town near Kaohsiung also called Chaozhou. 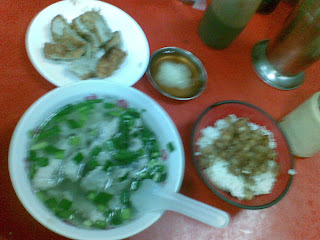 I suspect that the Taiwanese Oyster Omlette is a watered down version, as Taiwan used to be poor. Because oysters and eggs were expensive, so we threw in veggies and yam powder. There are many other local snacks at the 9th floor of FE 21. If sanitation is your concern about street vendors, here is a good alternative. This Zhou's Shrimp Roll looks good to me. 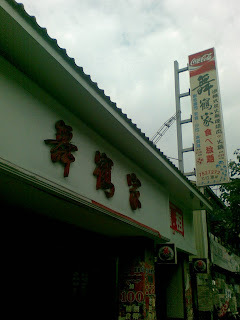 Many celebrities has dined here. The noodles also smells good to me. 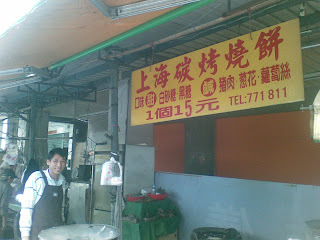 However, I have been spoiled by my gracious hosts in Tainan, where this restaurant originated. 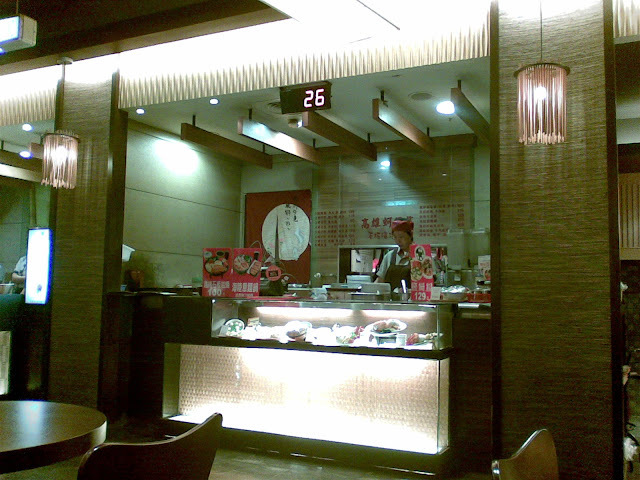 In addition, I was in the mood of steamed meat dumpling when I was there. Therefore, I have not yet checked it out. 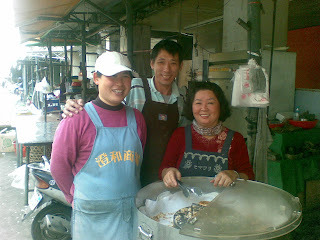 Their noodles, shrimp rolls, and crispy fried fish belly is on my to do list. 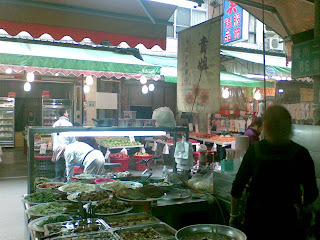 Often places offering Da'a noodle would have a lantern reads "passing the small months." 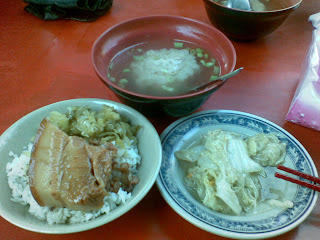 According to the legend, this dish originated from a fisherman in Tainan. There are a couple of months in the year where the wind is too strong and the waves too rough for fishing. 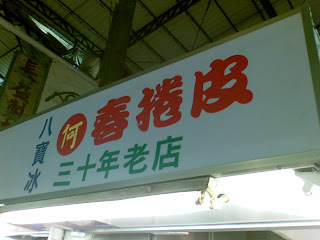 So the fisherman sold the noodles in order to "pass the small months." 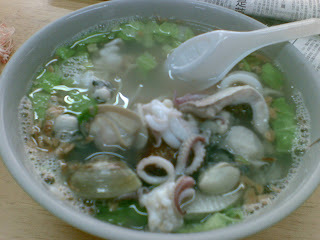 It is a specialty from Taiwan and Fujian of China. 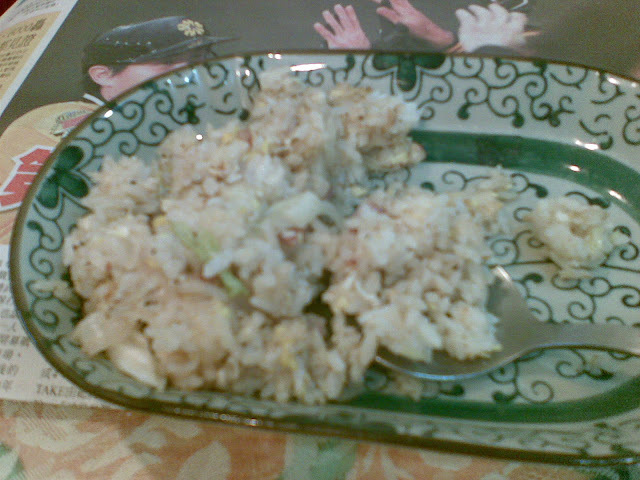 It is like a Chinese version of Buritto. I strongly recommend this dish, but you do not have to insist on this particular vendor. 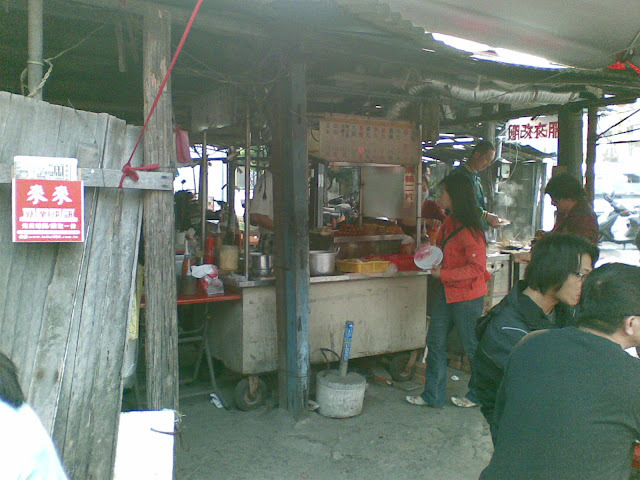 According to some books I read, Runbia is a dish for guests around Xiamen city. It is a shame that I did not have the opportunity to sample it while I was there. 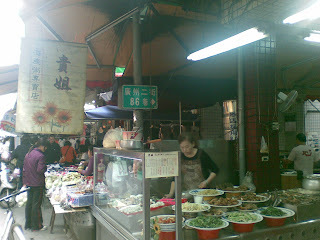 However, I did see vendors making the shell in a market in Zhangzhou city. 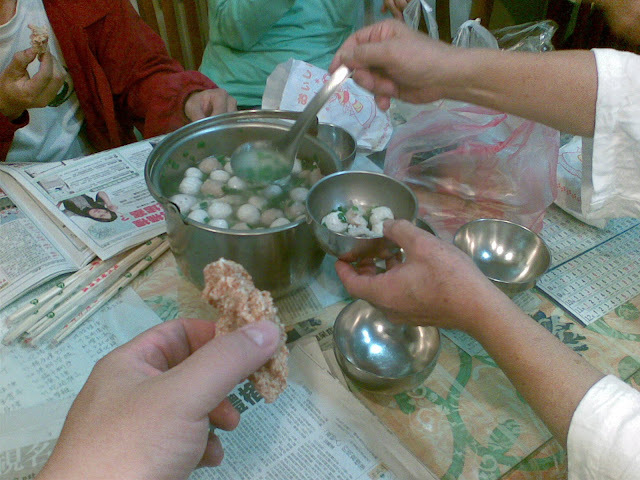 Compared with the Spring Roll from north-eastern China, its shell is thinner and larger. 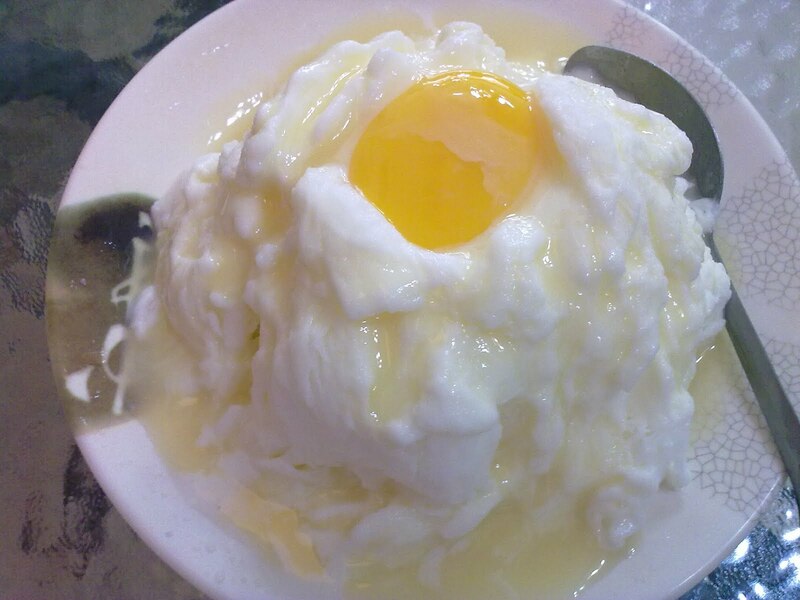 The fillings are about the same, with addition of white sugar powder and peanut powder. Among my favourite dishes, it is a rare exception as it is actually healthy, loaded with various veggies. The lady on the left is making the shell, while the other is making the roll.